"G" as in good. Motorola gives the third generation of its Moto G a refined face lift and delivers a superb money-performance bundle: A decent camera, long battery life, and up-to-date operating system. What's more, the device is now waterproof. While we wish the Moto G’s pricing and specs was clearer and the 2GB model isn’t quite the bargain basement must-have that previous Moto G models were, this is still a cracking budget Android phone. Almost every aspect of this phone has been improved over its predecessor with waterproofing an unexpected, but very welcome extra. You can’t go too far wrong with the superb Moto G.
Before you go and splurge all your cash on the latest whizzbang flagship, eviscerating your bank balance in the process, you owe it to yourself to at least get down to your local retailer and try out the latest Motorola Moto G (2015). It’s a very, very good smartphone – the best budget smartphone on the market – and well worth the asking price. 2013 marked what some regard as a sea-change with regards to the choice options open to users looking to purchase a new smartphone. Did you know that 84% of smartphone users feel they cannot go a single day without using their device; 60% of users admit they sleep with their phone; while 17% claim to have showered with their handset? One of the best aspects of the Moto G remains the price tag: at just $180 for the 8GB model with 1 GB of RAM, this smartphone is exceptionally affordable and a very decent value proposition considering the hardware inside. Spending an extra $40 is worth it if you want more storage and RAM, but there’s no denying that either option is a great choice if you’re after an entry-level smartphone. We started this review asking a pretty basic question about the Motorola G — does the third Moto G perfect the series? — and really, that question came down to one basic concept: is the third time the charm, so to speak. But the Moto G has never really needed to worry about that question because it has always been pretty good, evident from Motorola’s recent observation that this range is the company’s most successful smartphone. I’ve been won over by the Moto G since the first iteration in late 2013. With the 3rd generation, Motorola have improved on the original formula, and brought water resistance and improved on the second gen’s bigger screen and body. I must say I really really like the Moto G 3rd generation. I like it so much I’m using it as one of my main devices and have even used one of my precious Google Play Music authorisations on it. The only thing I find myself wishing the Moto G 3rd gen had is an AMOLED screen, mostly so that Moto Display uses less battery power. Motorola's original Moto G was one of the first Android devices to offer what one could honestly call a good user experience at a price of around $200. In the end, I think as far as conventional mid range devices goes there's no competition for the Moto G. The construction and the camera are good, the performance is the best of an ARM device at this price point, and the battery life is amazing. The third generation Moto G has certainly been impressive despite the specs not being the best of the lot. Moto G promises a good user experience and it more than delivers on that front. For someone looking at a decent mid-range phone with a long-lasting battery life and a decent camera, the Moto G is certainly an option worth considering. But only the 2GB variant as the base model with 1GB RAM and 8GB storage for Rs 1,000 less is not really an ideal deal. 100% Moto G 3rd Gen review (2015) - the new best budget smartphone? The 3rd Gen Moto G might not be the best value budget smartphone any more, but that doesn't stop it from being one of Motorola's best. I'll update this review once I've tested the £159 version, but for now, the £209 model comes highly recommended. Last year, I wrote that the then-new Moto G was "still the best budget smartphone" around. Little did I know that the quality bar for cheap phones would shoot into the air the way it did over the past 12 months. This updated Moto G faces fiercer competition than it ever has before, and it may well lose its hard-fought, low-cost crown someday. I’m so happy that Motorola’s found its niche in making affordable smartphones that don’t compromise on features. For around $200, you can get a perfectly capable Android smartphone that offers totally passable camera capabilities, solid hardware performance, long-lasting battery life, and a frequently updated version of Android (based on Motorola’s track record with updating its devices over the past few years). It has most of Motorola's signature extra features like Active Display and Moto Assist, and it’ll also survive a drop in the toilet. 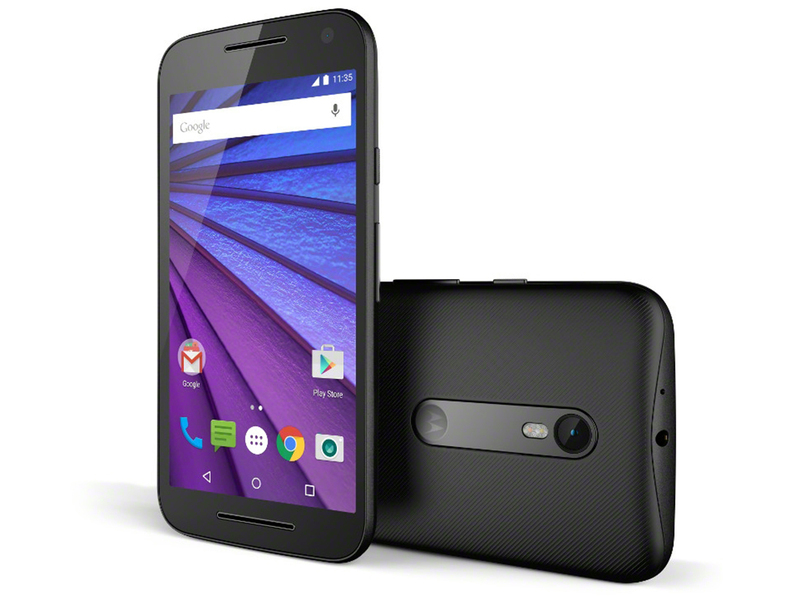 Motorola retains its championship belt for best low-cost smartphone in the world with the Moto G 2015 (3rd edition). While we were hesitant to upgrade from the Moto G to the 2nd edition Moto G, here the jump is great enough to make. Even those of you who own the original Moto G can rest easy knowing your cash is going towards a device that's worth the buck. Ultimately, we can forgive the tiny storage drives when practically every other aspect of the Moto G represents obscenely good value. The combination of sturdy design, good performance, quality cameras and a clean, up-to-date Android OS is nigh impossible to find in this price range, even counting previous models of this very handset. I’m so happy that Motorola’s found its niche in making affordable smartphones that don’t compromise on features. For around $200, you can get a perfectly capable Android smartphone that offers totally passable camera capabilities, solid hardware performance, long-lasting battery life, and a frequently updated version of Android (based on Motorola’s track record with updating its devices over the past few years). It has most of Motorola's signature extra features like Active Display and Moto Assist, and it’ll also survive a drop in the toilet. The only real bummer about the Moto G is its lack of NFC, so if you were hoping to become a part of the mobile payments trend any time soon, you’re out of luck with this device. While we wish the Moto G’s pricing and specs was clearer and the 2GB model isn’t quite the bargain basement must-have that previous Moto G models were, this is still a cracking budget Android phone. Almost every aspect of this phone has been improved over its predecessor with waterproofing an unexpected, but very welcome extra. While the Moto G (3rd Gen) smartphone is a decent phone at this price point, it is nothing compared to competitors like the Asus Zenfone 2 and Xiaomi Mi 4i, or even the lower priced Yu Yureka Plus and Lenovo K3 Note for that matter. Motorola may not want to enter the specs war, but it just isn't delivering the 'customer experience' that it promises. Motorola's done it again with this year's Moto G, and there's no point even considering going for any other phone if you're on a budget and need something quick, sharp and on point. If the OnePlus One (or its sequel) is just out of reach for you, and you want a no-compromise budget blower, this year's Moto G is a must-have. The Moto G punches above its weight in almost every way, and is without question the best phone you’ll find at anything approaching this price. It’s not an iPhone killer yet, but it does allow the millions of people who cannot or will not pay top dollar for a phone to get a truly first-rate device. It’s the clearest indication yet of the great things to come from truly affordable phones. But for now? It's easy to look at specs and compare the third-gen Moto G to similar devices, but this phone isn't about numbers, it's all about the experience. And as affordable experiences go, it's a true return to the top. Great software, including some useful Motorola-specific apps, make it a clean and clever device to use, while its decent battery life, water-resistance, improved camera, and the addition of Moto Maker personalisation options really make this Moto G stand out (the cherry finish of this review sample certainly helps too). It’s hard to be harsh on such a likable, and comfortable £209 phone. But the competition in the “just over £200” market is brutal. For £10 more today (in theory) you can get a brand new One Plus One with 3GB of RAM, blistering performance, superior 13MP imaging, NFC, 802.11ac, and a 1080x1920 display. What you get with the Moto G is a phone that continues to punch above its weight. We like the addition of the water resistant design and the camera improvements are welcome, too. It also offers the purest and most user-friendly approaches to Android, and it runs like a dream – especially on the 16GB version and its extra RAM. It's still one of the best value phones you can buy despite the slight price rise, which is why we still recommend it. The 3rd gen Moto G is the most capable member of the popular product family to date. Thanks to its zippy chipset, excellent camera and battery life, up to date stock Android, and superb build quality, the newcomer is also one of the most appealing entries in its price range. Unlike last year's rather conservative second generation, Motorola has really pushed the envelope with the latest Moto G. Newly introduced features like Moto Maker and IPX7 water resistance help the smartphone stand out in its overly crowded segment. This is comfortably the best Moto G to date, adeptly sticking to the series’ style by fixing the weaker part of the older versions rather than turbo-charging its strong points with, for example, a 1080p screen. The only problem is that this is also comfortably the most expensive model in the series. We’ve lost some of that cut-throat bargain feel, although the waterproofing and significant camera improvements mean the extra expense is worth it. Motorola has nailed it once again with the third-generation Motorola Moto G. Its camera is superb, the upgraded internals make it a more responsive phone, and the extra software features make it feel more like a flagship and less like a sub-£200 budget device than ever. But the existence of competition doesn’t nullify the very compelling product Motorola brings to the table with the Moto G 2015. Is ASUS’s ZenFone 2 a better option for the spec-obsessed? Absolutely. Is AOT’s IDOL 3 a better fit for audiophiles? You bet. The new Moto G is for neither of those groups. Instead, it’s an affordable handheld for the masses: a highly customizable smartphone with excellent battery life, great performance, and software that adds usefulness without bogging it down. If you can live with its lackluster camera and display, it’s absolutely a solid buy (at least at the higher tier). The 3rd-generation Moto G is a solid budget handset, with a brilliant premium-spec camera and thankfully smooth performance. The 5-inch screen may not be as razor-sharp as we’d hoped, but for anyone who loves snapping every moment of their everyday lives, it’s easy to recommend this bargain blower. Of course, the Moto G isn’t for everyone, but it strikes that perfect balance of value, design, and performance – while still staying true to the foundational principles of the series. There’s a reason why the Moto G series is constantly a mainstream, it just keeps on getting better. And obviously, we continue to see that with this latest iteration. Power users might not take fancy in this phone, but it still generates a broader appeal. Don’t underestimate the intensity of what it offers! Do we have a new best budget phone? If you are buying a smartphone to impress others, the Moto G 3rd gen probably isn't for you because there are no standout specifications to boast about. Having said that, casually dunking your phone in a glass of water while talking to your friends would be sure to catch their attention. On a serious note, though, we are happy to see water resistance make an appearance at this price point, and it's about time this feature became standard across all smartphones. The Moto X and Moto G are the names that brought Motorola back in the game, winning quite a lot of fans in the process. They have just reached their third generation and Motorola is sticking to its established formula for success - pure-Android approach, excellent handling and a nice little extra here and there. Motorola managed to create a signature touch of its own, while staying as close to pure Google intentions as possible. This, combined with timely software updates has earned the company a number. Model: The fully customizable Motorola Moto G 2015 truly allows the user to add personality to their smartphone. On the Motorola website users can build their Motorola Moto G 2015 by choosing from design options such as color combinations as well as technical specifications such as RAM and storage. The design is ergonomic with curved edges and a texturized back cover for a good grip. Durability is a strong point of the smartphone as it is IPX7 rated with protection against splashes and accidental drops in water. The Android Lollipop 5.1.1 device comes with a Snapdragon 410 quad core processor clocked at 1.4 GHz, up to 2 GB RAM, an Adreno 306 GPU and up either 8 or 16 GB internal storage. The Motorola Moto G 2015 also includes support for microSD while weighing in at 155 g. The 5 inch 720p HD panel is protected with Corning Gorilla Glass 3. Both, the 13 MP f/2.0 rear camera and the 5 MP f/2.2 front camera are able to produce good images. Other features are Bluetooth 4.0, A-GPS, and Micro USB. The 2470 mAh battery makes for up to 24 hours of mixed usage. 86.19%: This is a good rating above average. Nevertheless you should not forget, that 10-15% of all notebook-models get a better rating.